The Organizational and Operational Plan describes how you will structure your company and how you will carry out everything you present elsewhere in your business plan. Without an execution strategy, the rest of your plan is meaningless. Like the Marketing Plan, your Operational Plan is essential to the success of your business. It will be important not just to would-be lenders and investors, but also to you, to management and to your employees. You can’t take for granted that anyone, including you, understands exactly how to run your business on a day-to-day basis unless you’ve thought it through and made your expectations clear. A key difference between an Operational Plan you would prepare for internal use and one you will give to potential lenders and investors is that you do not need as much detail in the latter. In the business description, you provided the address where your business will be (or already is) located. If you have a retail location, describe the surrounding area and explain what makes this location effective. For example, you might be located on a major road that people drive on the way home from work, making it convenient for them to pick up groceries or a hot prepared meal on the way home. If your business only has an online presence – perhaps you run a service that dispatches independent contractors to clean homes – explain who operates the website and handles customer service, from where and why that arrangement makes sense. Also describe where your contractors live and how quickly they can reach your customers. Note any disadvantages or possible problems presented by your location and what, if anything, you have done or will do to counteract these negatives. Does traffic back up so badly on the road where your store is located that cars struggle to exit the parking lot during rush hour? Do you have enough parking spaces to handle peak volume? For an online business that uses independent contractors, what are the drawbacks associated with not having all your employees operating from a single location? What are the advantages? State whether you own or lease the property your business operates out of and provide the terms of your mortgage or lease. Present information such as the monthly payment, the length of the term, whether you are legally able to sublet and the terms of the early termination clause. If you rent, state whether your lease is net, double net, or triple net – in other words, is it you or the landlord who will be responsible for property taxes, insurance and maintenance? If your company is responsible for any of these items, how much do they cost? If you sell a product, the inputs that go into making it will be your supplies and the final product will be your inventory. Who will your suppliers be? Do you have multiple options available, or are you beholden to a single supplier, which may subject you to shortages and give you little bargaining power with regard to price and delivery schedule? What terms have you established with your suppliers? For example, do you pay cash on delivery, or do you have 10 days or even 30 days to pay? Do you get a discount for early payment? What kind of reputation do your suppliers have? Will they extend credit to your business, and if so, how much and on what conditions? Can you return unused supplies and if so, within what timeframe? What percentage of the purchase price will be refunded? It’s also important to explain how you will manage your inventory. If you have too much inventory, you’re wasting money that could be put to active use elsewhere in the business – and in the case of a grocery store, you’re actively losing money on inventory that spoils before you can sell it. If you have too little inventory, you’re losing out on potential sales, not to mention repeat customers – if you don’t have what they want, when they want it, they will go somewhere else, and they will likely turn to that company first the next time they need the item you used to sell them. Having good relationships with your suppliers can help you manage your inventory effectively. If you operate a service business, your workers are your supply. Have you hired enough contractors to meet the demand for your cleaning service? How do you check out their credentials and backgrounds to ensure that your customers receive a high quality work product and that your cleaners do not assault them or steal from them? Do you pay higher rates at times of higher demand to entice more contractors to work for you? If you’re creating a product, how will your production process work? Describe each major stage, including any processes that are outsourced and the technologies you use, remembering that you are writing for someone who may not understand the acronyms and terms of art common in your industry. Detail what you will produce, how much of it you will produce and how long it takes to produce each unit. Also elaborate on what methods of quality control you will implement, both during and after production. In the case of a grocery store, you may not be producing anything (unless you cook things in store), but you will certainly be distributing them. The same is true for a cleaning service – how will you match up homeowners who want their houses cleaned and landlords and tenants who want their apartments cleaned with your pool of workers? How will you match workers by level of skill and experience and distance from the client with the jobs you send them on? If it’s a product you’re selling – dresses, for example – in what stores will you sell them? Consider any arrangements that are already in place, and how you will get your product to the stores. You should also consider how and why these arrangements will work. In which types of stores will your fair-trade, organic cotton dresses will do well? Where have you already sold them and how have those plans worked out? Your team of managers and lower-level employees or contractors are the ones who will carry out most of the company’s operating plan, so it’s important to describe who they are, what their qualifications are and what their responsibilities will be. Include an organization chart showing the hierarchical structure of your business. What is the company’s management philosophy and business culture, and how will these contribute to your business’s success? How will you measure employee and management performance and reward them accordingly or let them go if needed? Your organizational plan should provide names and professional descriptions of each owner and manager your business will have; include the bios and professional backgrounds of all principals. The description of each top-level member of your organization should explain what their roles and responsibilities will be in your company and what they have done previously. You will want to emphasize how their backgrounds have prepared them to take on the challenge of running your new startup, and how they will help your current business succeed. For example, perhaps your chief operating officer previously worked for a company that used a network of independent contractors to provide handyman services. The company operated in a way similar to how your cleaning business will operate and he successfully sold the business for a profit after five years. Meanwhile, you used to work for the nation’s largest maid services company as its CEO and have many ideas about what makes a cleaning business successful and what hurts its bottom line. You know how to improve on the model of your former employer to create a superior offering. While you signed a noncompete clause there, your new company will operate outside of the clause’s geographic scope and its time limit has run out as well. Conversely, if an employee’s business background is in a significantly different industry, you might want to emphasize how this can be an advantage instead of a detriment. In addition to your managers, what other essential jobs are there in your company, and which key employees will perform them? What qualifications do they have to excel at these jobs? Provide cross references in your descriptions to the appendix, where you will include detailed business resumes for yourself and for each of these individuals. Lower-level staff members, if you plan to hire any, are important enough to mention in your business plan because they will be essential to the smooth functioning of your business. Explain how you will locate potential employees and what qualifications they must meet, what jobs they will perform, how you will compensate them and so on. Think about the information you would include if you were advertising one of these job openings, and include that in your business plan. Also note whether your business will hire any outside consultants or other independent contractors. If so, why? What functions they will perform? Finally, describe any positions you might want to add in the future if your business is successful enough to expand – managers for additional stores, for example. Six tips for creating a winning business in a losing economy. Is your business is ready for the next level? The signs may not be what you think. Structure, processes and mastering your revenue are the keys. If you think its time to test your wings and leave your parents nest, read on. Taking these three steps can help you figure out how much youll need to save for retirement based on your individual needs and goals. Severance Packages – Yes? No? Maybe? This is your five-minute elevator pitch. It may include a table of contents, company background, market opportunity, management overviews, competitive advantages, and financial highlights. It’s probably easiest to write the detailed sections first and then extract the cream to create the executive summary. Try to keep it to just a couple of pages. This is where you explain why you’re in business and what you’re selling. If you sell products, describe your manufacturing process, availability of materials, how you handle inventory and fulfillment, and other operational details. If you provide services, describe them and their value proposition to customers. Include other details such as strategic relationships, administrative issues, intellectual property you may own, expenses, and the legal structure of your company. Spell out your market analysis and describe your marketing strategy, including sales forecasts, deadlines and milestones, advertising, public relations and how you stack up against your competition. If you can’t produce a lot of data analysis, you can provide testimonials from existing customers. Provide bios of your company executives and managers and explain how their expertise will help you meet business goals. Investors need to evaluate risk, and often, a management team with lots of experience may lower perceived risk. This is where you provide the numbers that back up everything you described in your organizational and marketing sections. Include conservative projections of your profit and loss statements, balance sheet, and your cash flow statements for the next three years. These are forward-looking projections, not your current accounting outputs. Local SBA Small Business Development Centers provide free consulting and low cost training for building a business plan. Find one near you. Continue learning by reading a section-by-section breakdown of the business plan . What Are The ‘5 Parts of Every Business’? Value Creation – Discovering what people need or want, then creating it. Marketing – Attracting attention and building demand for what you’ve created. Value Delivery – Giving your customers what you’ve promised and ensuring that they’re satisfied. Take away any one of these five parts, and it’s not a business. When planning a new business or analyzing an existing venture, always begin with the five parts – they will help you discover any major issues or gaps quickly. Value-Creation . Discovering what people need, want, or could be encouraged to want, then creating it. Marketing . Attracting attention and building demand for what you’ve created. Sales . Turning prospective customers into paying customers by completing a transaction. Value-Delivery . Giving your customers what you’ve promised and ensuring they’re satisfied with the transaction. Finance . Bringing in enough money to keep going and make your effort worthwhile. WANT TO BE NOTIFIED WHEN UPDATES ARE PUBLISHED? Subscribe to Josh Kaufman’s email newsletter. You’ll receive Personal MBA updates, Josh’s award-winning research, and useful resources that will help you make more money, get more done, and have more fun. It’s free! 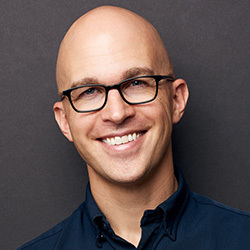 Josh Kaufman is an acclaimed business, learning, and skill acquisition expert. He is the author of two international bestsellers: The Personal MBA and The First 20 Hours. Josh’s research and writing have helped millions of people worldwide learn the fundamentals of modern business. © 2005 – 2018, Worldly Wisdom Ventures LLC . All rights reserved. 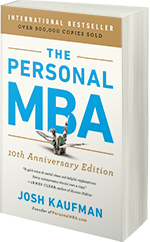 The Personal MBA: Master The Art of Business is published by Portfolio , an imprint of Penguin/Random House. All excerpts from the book are published under agreement with the publisher. This material may not be reproduced, displayed, modified, or distributed in any way without the express prior written permission of Worldly Wisdom Ventures LLC. “The Personal MBA” is a trademark of Worldly Wisdom Ventures LLC.